Quality of Life Care with PHC raised $3,215 on HandUp! We often take our core senses for granted –particularly when we’re accustomed to having ready access to health care and medical support. When a person is experiencing homelessness, these services are most often the last care they seek out, prioritizing shelter and food for their family first and foremost. However, it is often due to lack of these basic quality of life senses that a person will be less likely to maintain employment or find housing. Not being able to see properly, having severe tooth pains, being unable to eat due to lack of teeth, or the inability to hear are all conditions that may reduce a persons' safety. These hindrances can make a person less likely to receive housing, employment, and overall diminish their quality of life. 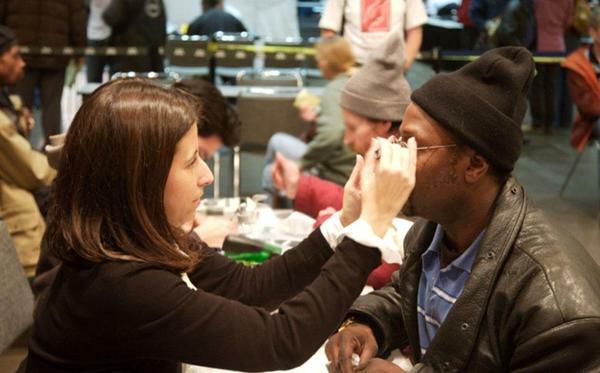 Project Homeless Connect provides Vision Services, Dentures, Dental Care, and Hearing Care –with zero cost to the Participant. We provide assistance to individuals from their first inquiry, to testing, and finally through to the completion of their medical needs. In doing so, we are seeing Participants feel more confident in seeking out further medical support and achieving their greater goals! Lloyd received dentures through Project Homeless Connect in 2017. After receiving dentures, he felt more confident visiting his children for Father's Day. There he relished in receiving his first compliment from his daughter. Who proudly exclaimed, "Wow daddy, you look a whole lot better with your teeth!" With this boost of newfound confidence, he has become more employable and he feels better able to focus on his goals. He is also no longer experiencing severe pain, which had previously caused him to seek out pain-reducing drugs– lowering his chances of sobriety. Now, Lloyd is employed as a hotel receptionist/desk clerk and has successfully moved onto Stage II in his drug treatment program. Flourishing in his new sense of self-esteem, Lloyd humorously shared, "I have more confidence in work and with the ladies!” Lloyd plans to continue living in sober living environments and working towards a future of sobriety. Stories like Lloyd’s show the greater impact that basic health resources can make toward bettering all aspects of a person’s life. Project Homeless Connect aims to help provide such resources to people, but we can’t do it without the help of our community. Each and every contribution makes a difference. We have a unique opportunity to double your donation! A generous donor has offered to match $3,000 in honor of his late mother, who passed away in 2016, in honor of supporting our San Francisco neighbors. Our Partner, Simply the Basics, is excited to match an extra $2,000. This means that through your help, we can effectively double each of your donations! $5,000 will become $10,000 toward our Quality of Life services, which directly impacts the care we can provide to our Participants and the greater community! You'll start to receive updates in your email on Quality of Life Care with PHC's progress.